Over 100 species of trees have been identified in the Duke Forest. The major types in descending order of prevalence are pine, pine-hardwood, upland hardwood, and bottomland hardwood. Pine stands grow on a variety of sites, which are usually the result of old-field succession or planting. The most common species of pine found within the Forest are loblolly, shortleaf and Virginia pine. Typically these pines grow on drier sites. The majority of upland hardwoods are second growth and are significantly influenced by soil type, physiology and past disturbance. Oak-hickory is the most widespread of the upland hardwood types and occurs on a range of well-drained sites, excluding rock, dry or shallow soil areas. Other upland cover types include the post oak-white oak communities, which occur on dry ridges and on shallow soils, and blackjack-post oak communities, which occurs occasionally on dry south-facing bluffs, thin-soil areas with impervious clay stratum. Lowland forest (or bottomland hardwood areas) occupy mainly mesic/hydric sites. Species composition in these areas are influenced by soil conditions and degrees of flooding. Typical communities include birch-sycamore (early successional floodplain types), yellow poplar-sweetgum-ash-red maple (occurring on poorly drained sites) and beech-maple-white oak- red oak (which occur on deep, rich, well drained soils). 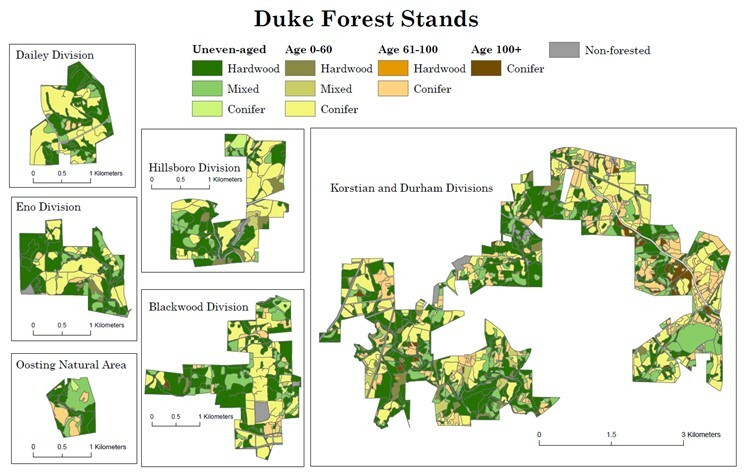 Maps of the forest stands in the Duke Forest. The range of age classes is also diverse. 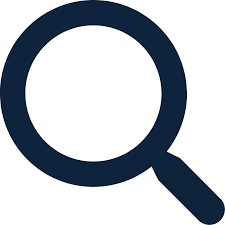 Natural stands of pine over 110 years old and hardwood stands over 200 years old are among the oldest age classes of timber, while new stands are being planted yearly. Many plantations have been established since 1931. The oldest and most common are loblolly pine. Other old plantations include white pine (1931), longleaf pine (1935), yellow poplar, and bald cypress (1937). Six hardwood community types, three upland and three lowland, are typical of those found in the Duke Forest. They are identified by the names of their dominant tree species. In addition, pure or mixed stands of pines occur as early successional communities. This is the most widespread type in the Forest, usually considered the typical upland climax. It occurs on a wide range of well-drained upland sites except for the very rocky, dry or shallow-soil areas. The most common overstory species are white oak, northern red oak, southern read oak, black oak, scarlet oak, and several hickory species. Common understory species include sourwood, dogwood, blackgum, red maple, and various viburnums. Many of the common spring wildflowers may be found here. Throughout the piedmont this forest type occurs on dry ridges and on shallow soil. Post oak is the most common overstory species, with white oaks and hickories. Both the overstory and understory tend to be open and brushy. Black oak, sweetgum, red oak and hickories occur in the understory. This is a rather uncommon hardwood type occurring on such sites as dry south-facing bluffs, thin-soil areas around rock outcrops, and on soils with an impervious clay stratum a few inches below the surface. Post oak and blackjack oak predominate. White oak, southern red oak, pignut and mockernut hickory are associates. Eastern red cedar is common as an understory or minor overstory component. Shortleaf pine is often found in small numbers. Dogwood, viburnum and persimmon are common in the understory with shrubs being infrequent. Stands of this type are open and irregular. The trees tend to be gnarled and rarely exceed 30 feet in height. The tendency for blackjack oak to maintain dead branches all the way to the ground results in a ragged appearance, and makes it difficult to penetrate the stand. This is typical early successional floodplain type occurring in narrow strips along the banks of New Hope Creek and in extremely wet lowland areas. Both of the major species are fast-growing and may reach large size while still relatively young. Sycamore is one of the largest of the eastern hardwoods and may reach 100 feet in height and 3 to 8 feet in diameter. River birch and sycamore dominate the overstory with hackberry as a frequent associate. The understory indicates the transitory successional nature of this type, consisting of mixed bottomland hardwoods including red maple, sweetgum, green ash, yellow popular and elm. Of the true understory species, dogwood, ironwood and eastern red cedar are often present. Shrubs and vines often are abundant, including button bush, elderberry, honeysuckle, greenbrier poison ivy and trumpet vine. Because this type is an early successional stage occupying stream banks and flooded areas, it is unstable and short lived. Repeated flooding and the resulting soil disturbance may however result in its perpetuation. This bottomland mixed hardwood type occurs on sites that are slowly drained but not subject to standing water. Birch and sycamore are often present as holdovers from earlier successional stands. Sweetgum and yellow poplar tend to be the most important species in the early development of this type, with ash, elm and red maple coming in later. Willow oak is a frequent component of older stands and, on deep soils, walnut becomes an associate species. Hackberry, swamp chestnut oak and shagbark hickory may also be present. Hornbeam, hop hornbeam and red mulberry, interspersed with eastern red cedar and dogwood, form the typical understory. The most common shrubs are arrowwood, elderberry, deciduous holly and eastern wahoo. Woody vines usually are abundant, including trumpet vine, Virginia creeper, grape, honeysuckle, greenbrier and poison ivy. This type occurs on sites of deep, rich, well-drained soil with minimal disturbance. Stable talus slopes below terrace bluffs and above moist floodplains are the most common sites. Since these areas provide rich soil for agriculture most of them have been cleared and cultivated in the past, leaving few mature stands of this type. Beech is the distinctive species of this type, but it usually is not as abundant as white oak, red oak, sweetgum, and southern sugar male. Willow oak, yellow poplar and shagbark hickory also may be present. Sugar maple usually dominates the understory along with dogwood, deciduous holly, hornbeam, and hop hornbeam. Shrubs are infrequent, but woody vines such as grape and poison ivy often are abundant. Loblolly pine grows on a wide variety of sites but reaches maximum growth on deep soils with good moisture and drainage. The understory in pure stands is often open, but in mixed or old stands, it is dominated by the hardwoods characteristic of the site. Shortleaf pine is somewhat more adapted to dry, fine textured upland soils than is loblolly pine. Although once common, pure stands of shortleaf pine are rare in Duke Forest today. Older shortleaf is more often found in mixed with a number of upland oaks and hickories. This is the widespread oak-pine type of the central states. On wetter sites yellow poplar, sweetgum and red maple are common associates. The understory often is composed of the later successional hardwoods. Virginia pine competes best on dry or very poor soils. It commonly occurs in pure stands on abandoned fields and is successful as a pioneer species on highly disturbed soils. The understory commonly includes other pioneer species and mixed hardwoods.